This case study focuses on the working and living conditions of tea plantation workers in India. A range of transnational companies are linked through supply chains to Indian tea plantations, including major food processing companies and retailers such as Unilever. Most individual tea plantations are Indian owned and managed. These plantations operate across several locations in India. Our research focused on plantations in Tamil Nadu, Darjeeling and Assam. Darjeeling and Assam tea is amongst the best known in the world, and is enjoyed by consumers globally linking the conditions in these plantations with tea lovers everywhere. Tea plantation workers face a number of issues concerning low wages, insecurity of employment, health and safety concerns, and poor quality of social infrastructure and services available to workers on plantations. A large range of grievance mechanisms are available in the tea sector and one of the questions examined in this case is why so few grievances have been brought through transnational non-judicial grievance mechanisms. A key focus is therefore on barriers of access to redress, including entrenched informal barriers based on the structure of social relations and organisation at the local level. The case study also examines the operation of formal transnational complaint handling mechanisms including the Rainforest Alliance certification system and the International Finance Corporation’s Compliance Advisor Ombudsman (‘CAO’), and their interaction with local grievance mechanisms operated by government, trade unions or plantation management. Where transnational grievance mechanisms have been used, their relatively weak leverage has meant that they have had little impact on facilitating individual remedy. However, where involvement of transnational non-judicial grievance mechanisms has provided visibility, legitimacy or other forms of indirect support to organising grassroots workers, the case suggests that engagement with these mechanisms can sometimes have a small, positive effect on reinforcing wider pressures for improvements to working and living conditions in the sector. An executive summary of the report is available below. 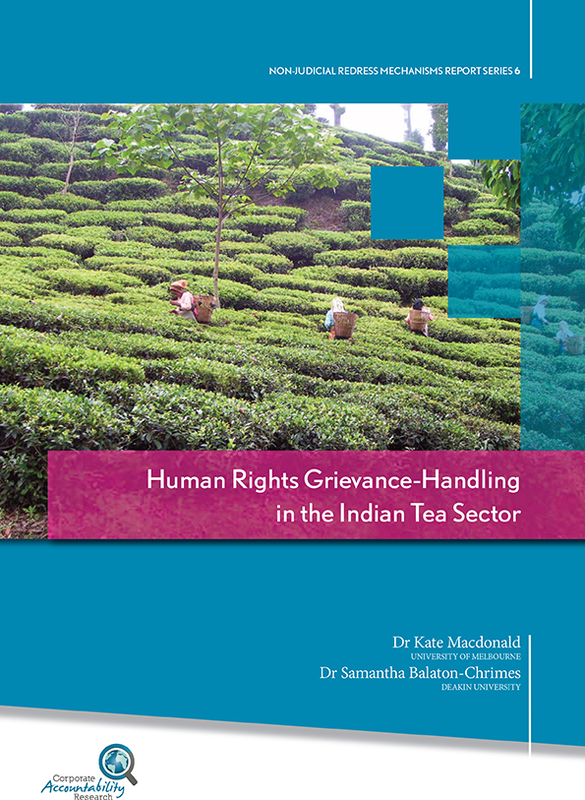 This case study focuses on the role of transnational non-judicial grievance mechanisms in remedying human rights grievances of workers on tea plantations in India who are linked to transnational supply chains. Business activity: This research spans numerous individual business enterprises in the tea sector. Indian tea production is dispersed across many individual plantations in different parts of the country. Our research focused in particular on plantations located in Tamil Nadu, Darjeeling and Assam. Many plantations are owned by individuals or families, though some large companies own multiple plantations. 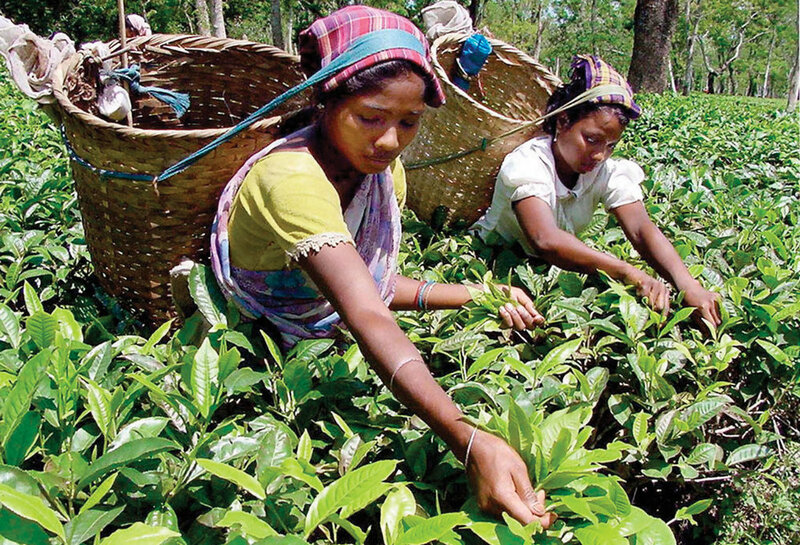 Transnational connections: Direct ownership and management of plantations is generally carried out by Indian nationals, and large India-based companies such as the Tata Group are involved in both tea production and processing. However significant proportions of tea produced in India are exported to foreign markets, giving rise to extensive links through supply chains to international buyers, who sell the tea on foreign markets. Human rights issues: Many of the human rights issues affecting tea plantation workers are related to labour rights. These include concerns about wage levels, precariousness of employment, health and safety issues, and gender or caste discrimination. Also important are concerns regarding the adequacy of provision of social infrastructure and services on farms. Available grievance mechanisms: When human rights problems arise, a number of grievance mechanisms are formally available to workers. The grievance arrangements most commonly used by workers are located at the local level, encompassing both mechanisms operated by estate management, and those associated with standard administrative and legal processes of labour regulation. · Grievance mechanisms linked to international certification bodies: In the Indian tea sector, many transnational companies participate in international certification schemes, which incorporate complaint systems. The social and environmental certification schemes Rainforest Alliance and Fairtrade are particularly prominent. Our analysis encompasses a general overview of these complaint systems, and documentation of one instance in which Rainforest Alliance conducted a Research Audit in response to an NGO report documenting alleged violations of Rainforest Alliance certification standards. · Complaints to the CAO: The CAO (explored in detail in another report in this series) has rarely been used as an avenue for pursuing grievances in the tea sector. This reflects both the restriction of the CAO’s mandate to the small number of plantations linked to companies receiving IFC finance, and multiple informal barriers to worker access. Nonetheless, we document two instances in Assam in which the CAO has been involved. · Complaints to OECD National Contact Points: We found no cases in which tea plantation workers have made complaints to OECD National Contact Points (NCPs), a form of grievance mechanism that is explored in detail in another report in this series. However, a complaint was once made to the UK NCP by Indian tea factory workers. · The Ethical Trading Initiative (ETI): The ETI (discussed in detail in another report in this series) operates programmes designed to address systemic violations of the ETI Base Code on issues such as living wages that are of relevance to the Indian tea sector. A number of tea growing and/or packing companies are currently members of the ETI, including Finlays, Keith Spicer and Typhoo tea. The ETI has convened discussions between ETI members and non-members regarding concerns raised about standards in the Indian tea sector, particularly in tea estates in Assam and West Bengal. However, to our knowledge, the ETI has not investigated specific allegations of ETI code violations in the tea sector. The evidence we present regarding existing grievance handling mechanisms in the Indian tea sector paints a rather sobering picture of the limited capacity of both local and transnational grievance handling systems to provide remedy for human rights shortfalls experienced by workers in this sector. Workers experiencing human rights grievances rely primarily on complaint handling processes facilitated by supervisors and managers on tea estates. In some instances, workers pursue formal complaints through the government Labour Department, usually with the assistance of a trade union. · Estate-level complaint-handling mechanisms have the advantage of being much more accessible to workers than other alternatives, and these play an important role in facilitating responses by management to some day to day problems. However, workers have very little bargaining power in their engagements with employers, and responses by management to address complaints are highly discretionary. The adequacy of responses to worker complaints varies substantially across individual estates and across different kinds of complaints. While such mechanisms can help to deal with small, routine problems such as a missed payment, they do not enable workers to challenge more systematic issues such as wage levels, or the overall adequacy of social infrastructure or health and education facilities provided on estates. · Legal and administrative complaint-handling mechanisms are an extremely important means of enabling workers to pursue formal remedies for disputes concerning individual grievances such as alleged non-payment of bonuses or other statutory entitlements. However, they have significant entry barriers and are slow and costly to use. · Where trade unions have both presence and organizing strength in a particular plantation or tea growing region, they can play an important role in facilitating worker access and bargaining power within both estate-based and government complaint mechanisms. However, union presence, cohesion and strength is highly variable across different districts in which tea is grown. · Marginalized workers experience pervasive and multiple barriers to access to transnational grievance mechanisms, as a result of a lack of information about the existence and procedures of available mechanisms and/or means of contacting them; weak organizations at the local level to provide advice and support; lack of trust or confidence in complaint systems; lack of time and other resources required to pursue a complaint; and broader weakness of rights-consciousness amongst workers. · Such barriers highlight the difficulties of establishing well-functioning grievance mechanisms in the absence of strong rights consciousness and organizational capacity amongst affected groups. · Local trade unions, NGOs, or other grassroots organizations with a physical local presence and established relationships with affected workers play a critical role as intermediaries in facilitating worker access to available grievance systems. · In turn, local organizations with direct connections to workers usually depend on relationships with national or international NGOs who possess prior knowledge of transnational grievance mechanisms, and can provide required information and advice. Such organizations also play a significant role in providing ongoing information and support to workers once a complaint has been made and a grievance-handling process initiated. · The ability of transnational grievance mechanisms to influence the resolution of individual grievances, or wider patterns of human rights practices in the sector, is importantly constrained both by limits to their leverage, both directly over the transnational companies they regulate, and indirectly over local producers. · The influence of transnational grievance handling mechanisms on local human rights practices is further constrained by the need of transnational mechanisms to establish their legitimacy as voices within local political debates concerning human rights practices in the tea sector. The authority of international bodies has often been challenged by accusations of ‘foreign interference’ when outside organizations become involved in local labour disputes. · Where small or indirect forms of influence over disputes have been exercised by transnational grievance mechanisms, such effects have usually depended on the ability of these mechanisms to support worker organizing efforts or strengthen the bargaining power of workers within negotiation or mediation processes. · Building cumulative leverage over wider human rights practices via coalition building. The accessibility of grievance systems for marginalized workers could be strengthened both by direct outreach activities to provide information and support to affected workers, and by support for the emergence and operation of trade union and civil society networks in targeted sectors and locations. · More extensive and proactive outreach and capacity building activities supported by certification organizations or financial institutions to which transnational grievance handling mechanisms are connected could make a significant contribution to facilitating worker access to available mechanisms. · To be effective, outreach would need to go significantly beyond the simple provision of information—also facilitating connections between communities of workers and individuals or organizations able to play an ongoing liaison and support role. · Transnational grievance handling mechanisms could also more pro-actively support the emergence and operation of networks of local, national and/or international trade unions and NGOs through which such liaison and support functions can be provided. In the rare cases where a group of workers gets to the point of submitting a complaint, capacity gaps and power imbalances between workers and companies in the grievance-handling process itself also need to be addressed. · There would be value in greater provision of support for organizational and collective decision making processes amongst workers at the local level. The forms of support required would vary between contexts, potentially including support for: strengthening local worker organizations; supporting record keeping and evidence gathering in relation to prospective grievances; strengthening networks and relationships between groups of workers; and building rights-awareness amongst affected workers and communities. · Such support could be provided, as appropriate, by grievance handling bodies or the organizations that establish them, or by local intermediary organizations such as NGOs, trade unions or other grassroots organizations. Any provision of capacity building to marginalized complainants by grievance handling bodies themselves would need to appropriately balance responsiveness to entrenched power imbalances with a commitment to principles of procedural impartiality. · In some cases, it may be appropriate for local intermediary organizations such as trade unions or NGOs to not only support but also actively represent directly affected workers within grievance processes. Clear guidelines would be required to govern any proposed instance of worker representation, to ensure workers were properly represented and empowered within the process. · Even in the presence of active measures to mitigate power imbalances between workers and companies, significant imbalances are likely to persist. Such power imbalances should be publicly recognized and appropriately accommodated by the procedures of transnational grievance handling mechanisms. Such accommodation may include: a willingness to accept diverse forms of evidence, and recognition of the potential legitimacy of aggrieved workers continuing to pursue their claims through parallel avenues while mediation processes are ongoing. Transnational non-judicial mechanisms tend to have the biggest impact when their interventions interact with and reinforce broader pressures for change. Such interactive forms of influence are often very indirect, and sometimes unplanned. · To some extent, the mere involvement of a transnational grievance mechanism such as the CAO, regardless of the details of its procedures, can provide some support for marginalized groups making claims, by enhancing the visibility or credibility of grievance claims in the eyes of other local or transnational actors. · Such a complaint may provide a focal point that can help NGOs or other grassroots organizations to build rights-consciousness and mobilization capacity amongst workers, or support networking and relationship building between organizations. · Grievance handling mechanisms may also have indirect effects on wider mobilizing efforts to the extent they can assist local groups to gather and mobilize evidence to support their claims. · They may more systematically and extensively document lessons learned from specific complaint handling processes regarding both complaint handling processes and underlying drivers of recurring problems, including identification and analysis of external obstacles to change. · Where appropriate, proposal of specific policies or guidelines to support prevention of recurring grievances may be developed and disseminated, which other business or government actors may then choose to take up—though in the tea sector codified standards, both governmental and non-governmental are already extensive. · Lesson-learning, advisory and associated capacity-building functions may sometimes seek additional support from external aid and development organizations—bilateral, multilateral or non-governmental—working to build capacity or otherwise promote wider change in relevant sectors. · Such functions are often inherently political, even if not presented as such, and transnational bodies taking on such roles would need to establish legitimacy for these roles with local audiences in any specific national or subnational jurisdiction. This is often very challenging, in the presence of significant sensitivities around perceptions of foreign interference in local political processes. The extent to which a given transnational grievance handling mechanism can contribute to wider sectoral change through making such active contributions to promoting wider change depends on a number of factors, including: its own internal capacity and resourcing; its visibility, profile and perceived legitimacy in a specific location and sector; and its existing networks and relationships. · The CAO may often be particularly well placed to make such contributions given its relatively strong organizational resourcing and high visibility. Taking on such a role would require the CAO to broaden the mandate of its existing advisory function to encompass externally oriented advisory activities—within the limits of its external legitimacy in a given local political setting. The CAO’s broad geographical and sectoral focus means that such a contribution could appropriately focus on more general lessons regarding human rights grievance handling and prevention approaches. · Private standard-setting bodies may be able to carry out some similar functions in particular locations or sectors where they have strong local presence and legitimacy—in some cases building on existing organizational systems and relationships. A more detailed focus on recurring drivers of grievance in particular sectors and geographical locations may be feasible and appropriate for such bodies.